A surfer is in hospital after fighting off a shark with his board near Ballina on the Far North Coast of NSW. Emergency services were called to Shelly Beach about 7.10am this morning (Wednesday) following reports of a shark attack. The man, 43, took himself to Ballina District Hospital with a gash to his left calf, a Northern NSW Local Health District spokeswoman said, and he remains in a stable condition. The man is due to be taken to Lismore Base Hospital for further treatment. "He came onshore, wrapped his leg up and went to Ballina Hospital. He's now been transferred to Lismore Hospital. He's got an eight inch [20-centimetre] cut on his calf." Police remained on Shelly Beach. Officers took the surf board and are liaising with Department of Primary Industries to identify the species. 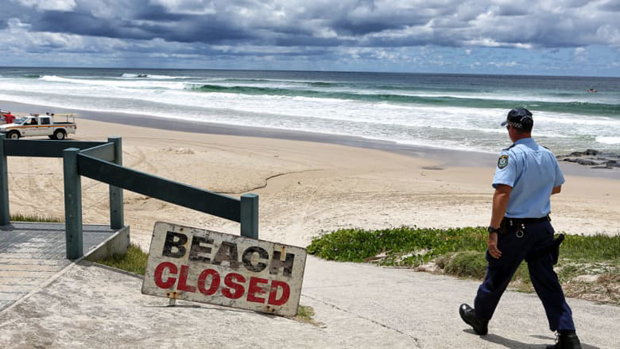 Shelley Beach and surrounding beaches have been closed for 24 hours, police said. The Shelly Beach incident comes just days after a Victorian doctor was killed in a shark attack in Queensland. Daniel Christidis, 33, was sharing a paddle board with a female friend in Cid Harbour in the Whitsundays when he was attacked about 5.35pm on Monday, and suffered severe injuries to his left thigh, right calf and left wrist. Dr Christidis was given immediate first aid from the group of doctors and medical practitioners he was with, and he was flown to Mackay Base Hospital in a critical condition. He died in hospital. He was on the first day of a five-day cruise of the Whitsundays, and was due to begin a training placement at a hospital. Wednesday morning's shark attack is not the first at Shelly Beach. Mr Nakahara, a Japanese national who lived in the area, was surfing when he was attacked by the shark, estimated to have been 3.5 metres long. Two surfers pulled him from the water and began first aid, but Mr Nakahara died on the beach. He was farewelled by a large community gathering at Shelly Beach.